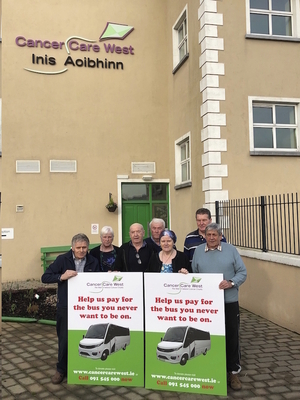 Cancer Care West, the West of Ireland cancer charity, is to launch a new bus service for Mayo Cancer patients who have to travel to University Hospital Galway to receive treatment for cancer. 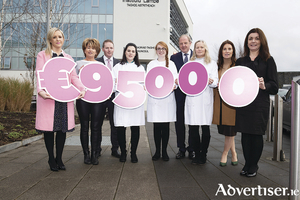 The National Breast Cancer Research Institute together with Galway Racecourse announced yesterday that the recent ‘Race in Pink’ fundraising event hosted at Ballybrit on Sunday October 28 as part of the new three-day October Festival, raised a staggering €95,000 for the charity. 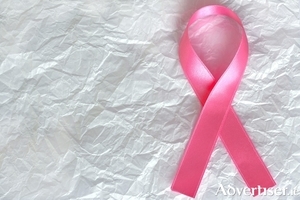 With a 25 per cent increase in the number of breast cancer cases over ten years, the Irish Cancer Society is urging women to be aware of the signs and symptoms of the disease. If you would like to lose some weight and feel healthy and energised you may want to consider acupuncture and traditional Chinese medicine (TCM). 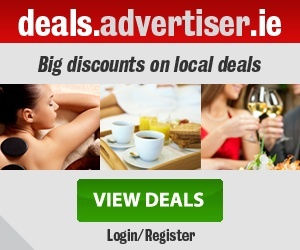 As October is Breast Cancer Awareness Month, on Thursday October 12th Caprice Cafe will host a very special Dinner ‘Dine in Pink’; in aid of Breast Cancer Research, to help raise funds in support of the Galway based charity who fund a comprehensive breast cancer research programme at the Lambe Institute for Translation Research, NUI Galway, headed-up by Prof. Micael Kerin. 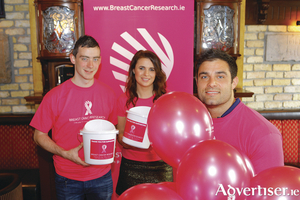 The eighth Mayo Pink Ribbon Charity Cycle for Breast Cancer Research will take place on Saturday April 29. 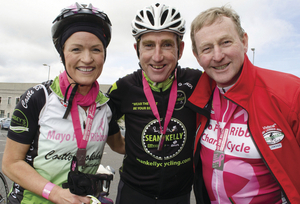 The cycle will be lead by legendary cyclist Sean Kelly and Mayo Pink Ribbon patron, An Taoiseach, Enda Kenny. 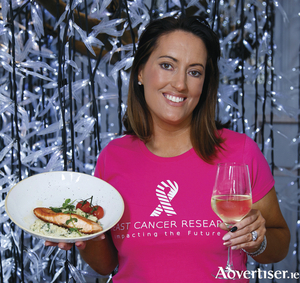 In support of October being the dedicated Breast Cancer Awareness month, Blake’s Corner Bar located on Eglinton Street has partnered up with Breast Cancer Research to host a jam-packed charity week from Monday October 24 until Sunday October 30. More than one in six outpatient attendances at Galway University Hospitals (UHG and Merlin Park) in 2014 involved newly diagnosed cancer patients. The Connacht Hotel in Renmore will be hosting a coffee morning tomorrow Friday October 23 in aid of Breast Cancer Research. Burgess Department Store, Athlone, is supporting the Marie Keating Foundation’s ‘Give your Bra for Breast Cancer’ campaign.